The Ubaye River (nicknamed the the Rivière Myhtique) has given its name to the valley. 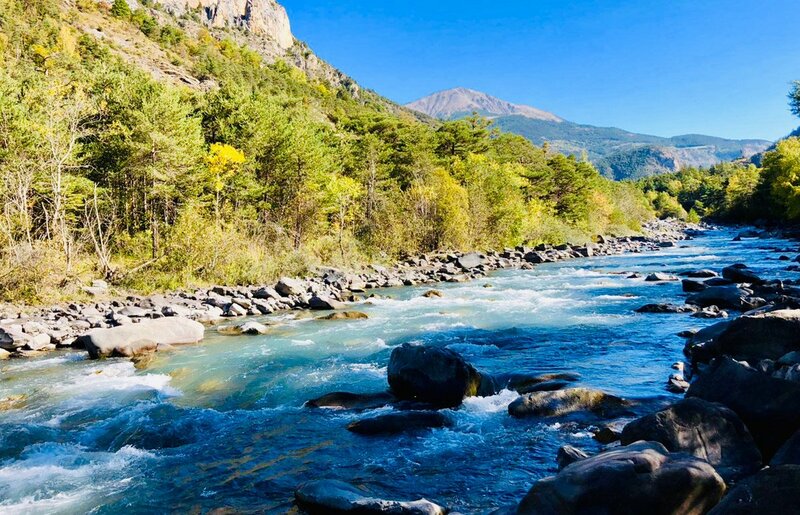 A category one river, preserved and mysterious, the Ubaye is often considered one of the most beautiful in Europe, offering a stretch of nine, class II (the easiest) to class VI (regarded as insurmountable) descents over 60 rapids lasting for 50 kilometers. White water sports such as rafting, hydrospeed, canoeing and kayaking can all be enjoyed directly from Camping River, which is regarded as one of the nicest sections of white water in France, combining the beautifully preserved natural site and technical quality with no less than 20 exciting rapids. 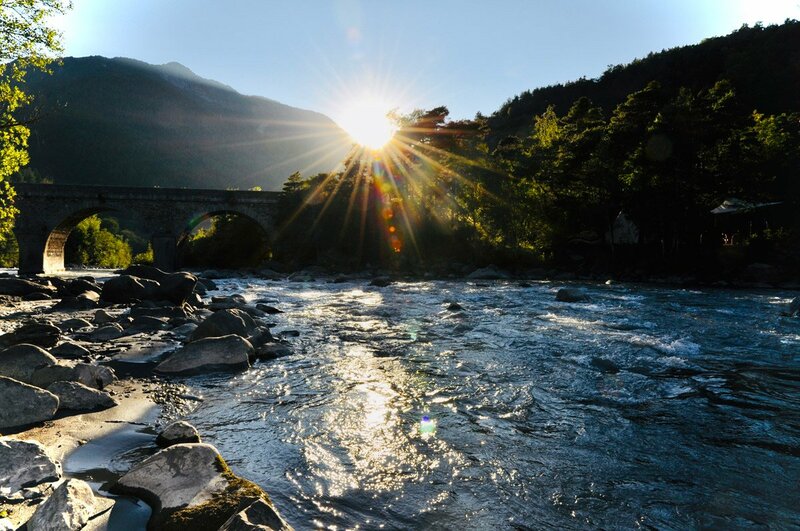 The River Ubaye has a nivo-pluvial system, meaning its rate depends on winter snow in the spring and rainfall during the summer. It is flooded in the spring bringing the level to around 80m3/sec, then stabilises and descends gradually to reach about 13m3/sec in late summer. It has no dam affecting its flow, which gives it the status of a mythical and indomitable river. A calmer more relaxing alternative to the more sporting sections of the lower valley. Follow the course between narrow cliffs and gorges and take in the beauty of la Bonette and Barcelonnette which extends to the Pra Loup ski/VTT resort. 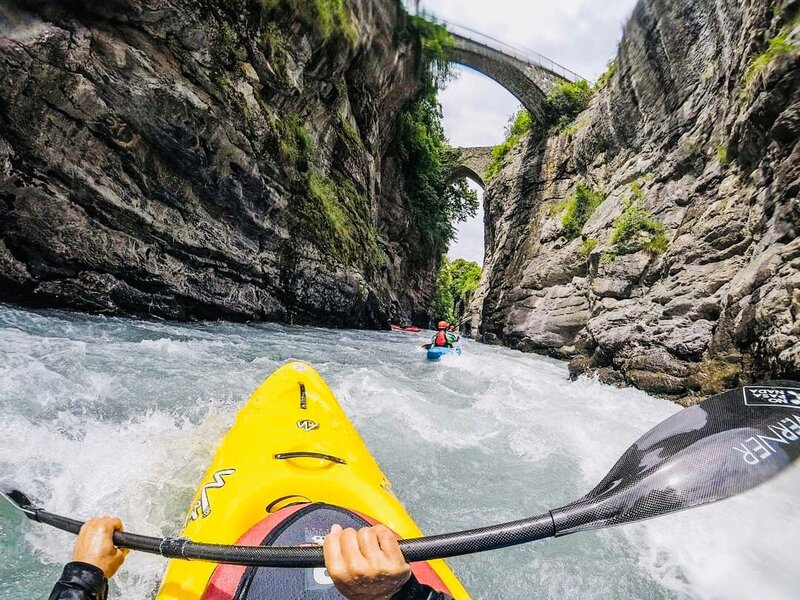 From the village of les Thuiles, the river gains momentum, the gorges open up and you pick up speed over numerous class II and III rapids. Slaloming between rocks and water holes to the village of La Fresquière where you must stop if you are not experienced enough for the class V rapids which follow. Continuous rapids rage over the high descent that is the course “the High ex-impassable” which gave the river its reputation. This section from Fresquière Bridge to Le Martinet and Camping River changes each season giving the River its indomitable character. The invincible course which departs from the campsite. 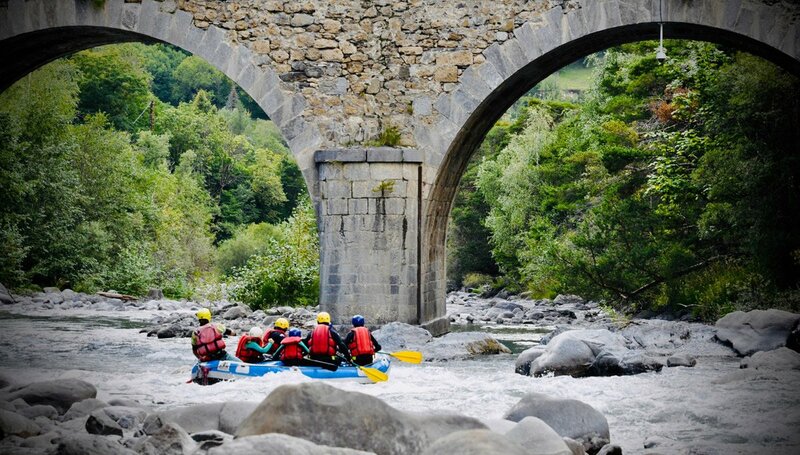 Our location lends itself to a perfect launch onto the river and is located at the heart of the lower Ubaye rafting community. In spring, this class IV section is demanding and adventurous. The sequence of 20 rapids, begin soon after the depart with the “beating” and the “bathroom”. A small quieter section follows to take in the beauty around you, before you find yourself amongst new waves and rapids including the “shark tooth” or ‘spring roll”. Following the veins of free water makes this course a classic and earns the River Ubaye the reputation of the most beautiful river in France. This is the most technical and most demanding descent of the valley. A 5km stretch of considerably high descents and perilous trajectories, class V and VI rapids such as the famous “La Fosse aux Lions” that only the most experienced can cross. Attention – The first rapid is particularly dangerous. 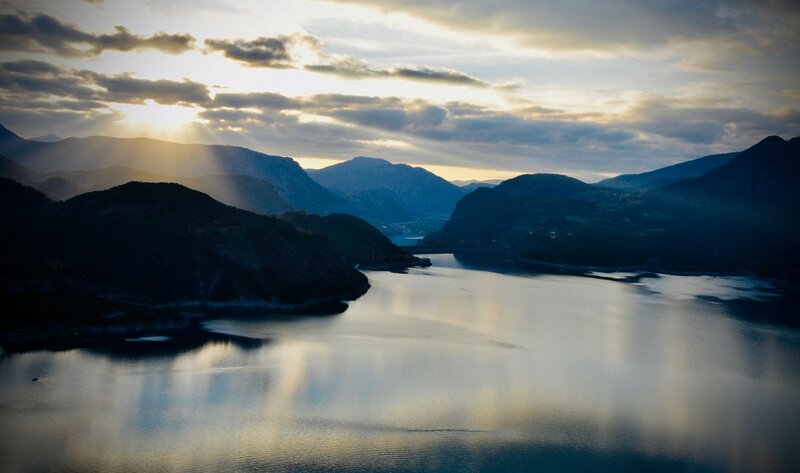 The adventure terminates in the majestic Lake Serre Ponçon. 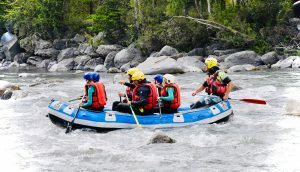 In 1980 the first French Kayaking championships were held in the River Ubaye and national competitions have continued in this river with the French sprint championships taking place here at the campsite this July 2019. 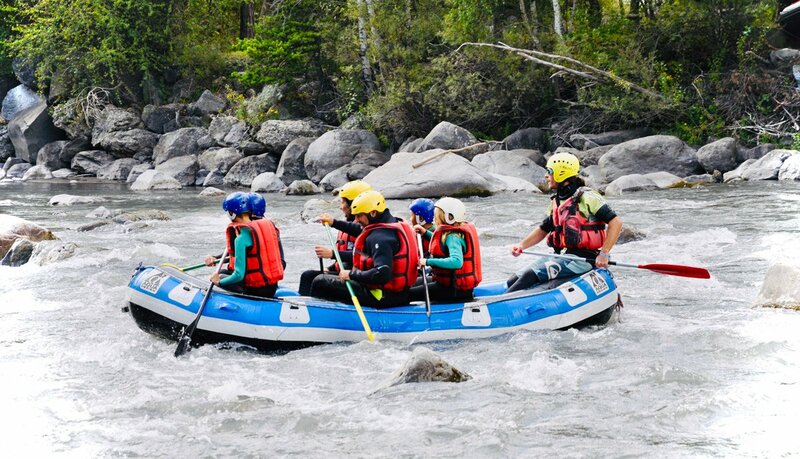 Rafting is a perfect activity to share with your friends or family. A real team event, everyone can find their place and experience great fun together. It is practiced on an unsinkable craft with 3 to 8 places especially designed for white water. The raft has a self-draining system so does not fill with water. Sitting on the edges of the boat, feet secured to purpose made straps, it is in complete safety that you will test the rapids of the Ubaye. Equipped with paddles, you will follow the instructions of your guide to manoeuvre the boat and to overcome obstacles and rapids. Some descents are ideal for family, others are discovery routes with varying difficulty and some descents fall into the category of sports course! Often regarded as ideal for exploring the river, you will be spoiled by the stunning natural beauty around you. Experience the breath-taking Gorges de Lauzet and look for the imposing mountain peak of la Tête de Louis XVI. At Camping River, we are lucky to have our own private guide, Christoph, who will tailor make a rafting descent to suit all the needs, requests and ages of your group. Starting your training in the tranquillity of our onsite lake, you will feel confident before you enter the wild water of the river. 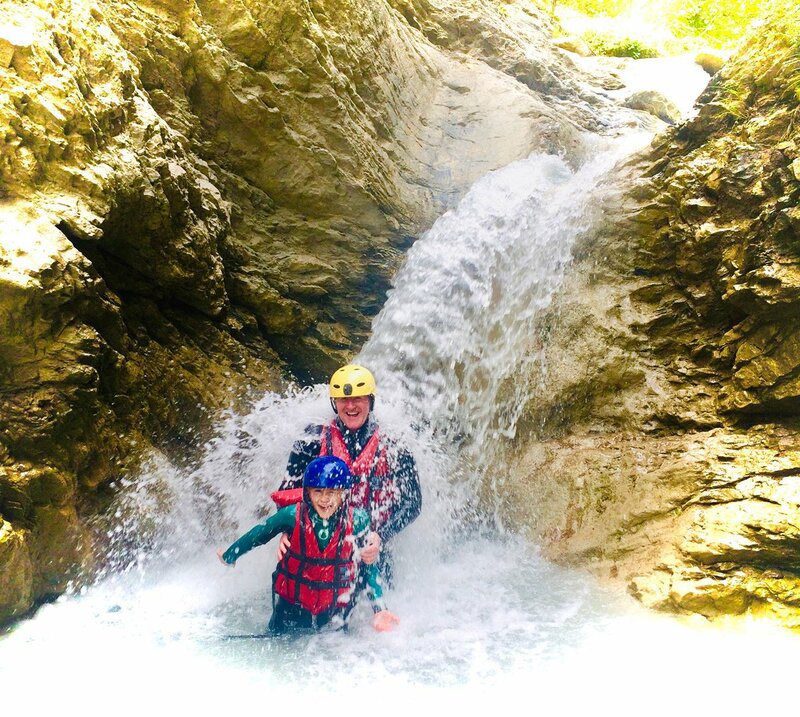 Why not try a new way to descend the Ubaye River. Ask us for more information about equipment rental. 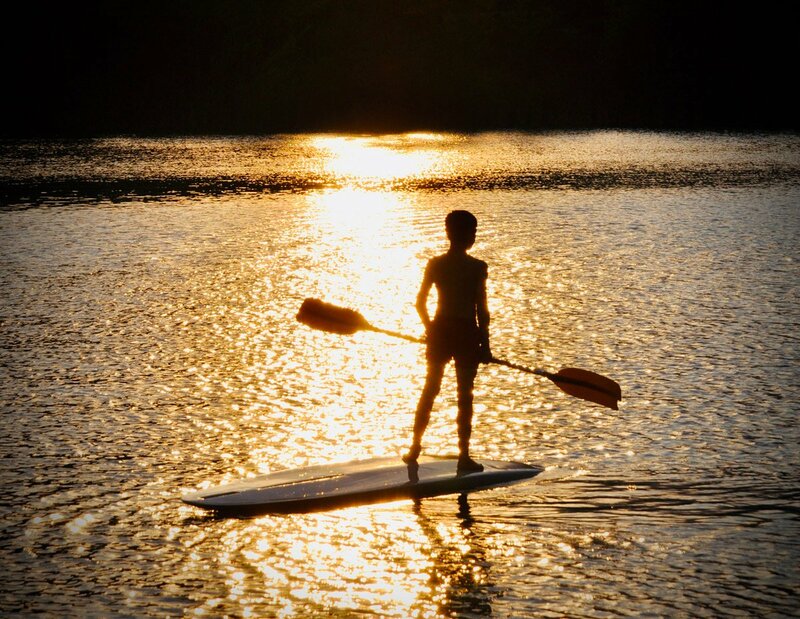 The most accessible individual activity which consists of using a foam board and a pair of flippers. The hydrospeed plays a real shield role due to its design, which guarantees protection from rocks along the route. Surf the waves and have fun without taking risks. An inflatable canoe which allows two people to embark on a descent independently. Light and easy to handle in all situations, the inflatable craft is forgiving when errors are made. Ideal for discovering and learning techniques of the river.